Tractor-trailers can weigh up to 80,000 pounds, and the sheer size and speed of these vehicles pose significant safety risks to other motorists when a truck driver engages in negligible behavior. At the Shiner Law Group, we understand accidents involving commercial vehicles are among the most catastrophic on Florida roads, so we aggressively advocate for truck accident victims to secure the financial recovery they deserve. If you or your loved one has been involved in a Florida truck accident, contact our experienced Weston truck accident lawyers to discuss your legal rights and options, as you may be entitled to financial compensation. In the event of a truck accident, parties with a financial interest at stake will take proactive measures to reduce liability. Insurance companies may appear amicable to victims but will dispatch an emergency response team to gather critical evidence to shift fault or significantly damage a personal injury claim. If conditions permit, contact emergency services and seek immediate medical attention. Forgoing treatment may not only exacerbate minor concerns but can weaken a claimant’s ability to recover compensation. Record picture and video evidence of the crash site, note the conditions, and collect the contact information of eyewitnesses. Do not speak to insurance companies or issue statements without first consulting legal counsel. Florida is a comparative negligence state, which means fault can be assessed to several parties in an accident involving a tractor-trailer. Claimants must show the truck driver owed a reasonable duty of care, and that a breach of duty resulted in financial loss. The truck’s owner, driver, and hiring company, as well as the company and employees responsible for loading and securing cargo, can be held liable for damages. If the truck or trailer was leased, the leasing company can be held at fault. Claimants can also pursue a legal cause of action against manufacturers if product liability contributed to the accident. The statute of limitations for pursuing a personal injury claim against a negligible party is four years in the state of Florida, or two years in cases of wrongful death. Depending on the degree of injuries sustained, truck accident victims can quickly exhaust their personal injury protection (PIP) benefits, as medical expenses may exceed $100,000. Most tractor-trailers in Florida are owned by third-party companies that offer several coverage options, which may separate compensation for bodily injury and property damage; however, medical bills not insured by PIP will be considered out-of-pocket expenses and covered by the at-fault driver’s insurance company. 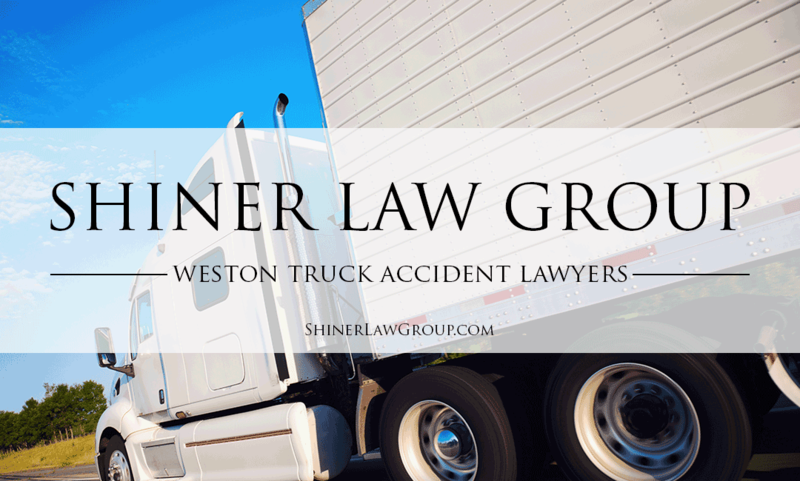 At the Shiner Law Group, our award-winning truck accident lawyers have secured millions of dollars in settlements and verdicts for Weston truck accident victims and their families, because we believe at-fault parties should be held accountable for their reckless and negligent behavior. With over 15 years’ experience helping victims recover from their accident, our trial lawyers aggressively advocate for a broad range of damages: medical treatment and rehabilitation, pain and suffering, disability, lost income, reduced earning capacity, and a permanent inability to engage in gainful employment. While we make every effort to negotiate a fair settlement outside of court, we are equally prepared to take your case to trial against large national insurance chains and their policyholders to maximize your claim’s financial recovery potential. Have you or someone you love been injured because of the negligent, reckless, or intentional conduct of another? Call us at (954) 999-9900 or contact us online for a free case review.